Photo from https://nsuspartans.com. Used with permission. The Spartans pulled off an upset of a much higher seed in the first round of a national post-season basketball tournament. The men’s basketball team downed No. 1 seed Alabama in the NIT’s first round, knocking out one of the tournament’s top contenders. Norfolk State won 80-79 in overtime. As the No 8. seed, the Spartans entered the game as a 16.5-point underdog. Since the NIT went to its current format in 2007 with 32 teams, NSU became the eighth No. 8 seed to topple a No. 1 seed in the first round and the first since Cal State Bakersfield in 2017. Including this season, top seeds are now 44-8 since 2007 against the No. 8 seeds in the first round. Seven seasons ago, the Spartans pulled off one of the biggest upsets in NCAA tournament history, when as the No. 15 seed, they beat No. 2 seed Missouri 86-84 to advance to the third round of the NCAA tournament. 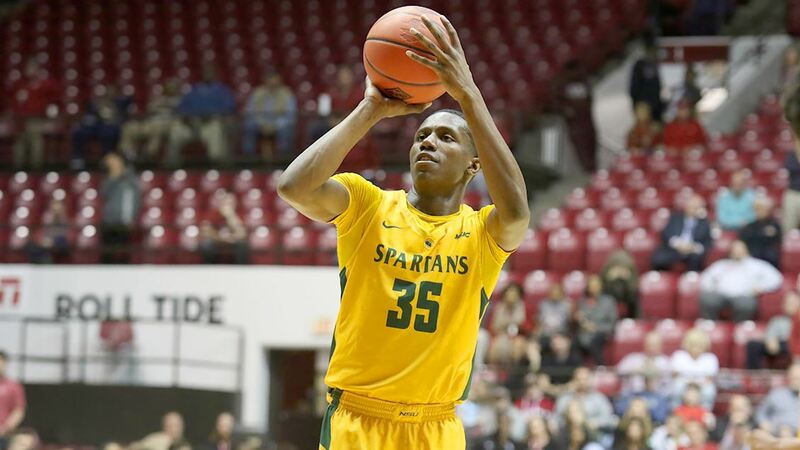 The Spartans, playing in the NIT’s second round, will take on the No. 4 seed Colorado Buffaloes, on the road, Monday, March 25, at 9 p.m. The game will be broadcast live on ESPN2. Fans can also listen to the game on WNSB Hot 91.1 FM. Tags: Alabama, basketball, NIT, Norfolk State, Spartans. Bookmark the permalink.